The Filstar replacement suction cups are the original suction cups included with all API Filstar and Nexx Filters systems. Replace if worn or missing. Suction cup clips for Filstar and Nexx filter systems ordered separately. 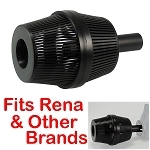 840136-00 fits Filstar, 772A1 fits Nexx Filter System.